A unique Talk Show series covering an insider’s view of Malaysian and International Mover & Shakers – their life, success secrets, struggles and achievements. Movsha is the influential international business networking creating life-changing connections and ideas with influential movers & shakers and entrepreneurs from across industries. Movsha (pronounced as mor-sha) is a coined word by the Founder Robert Chaen, by combining the two words mover and shaker. 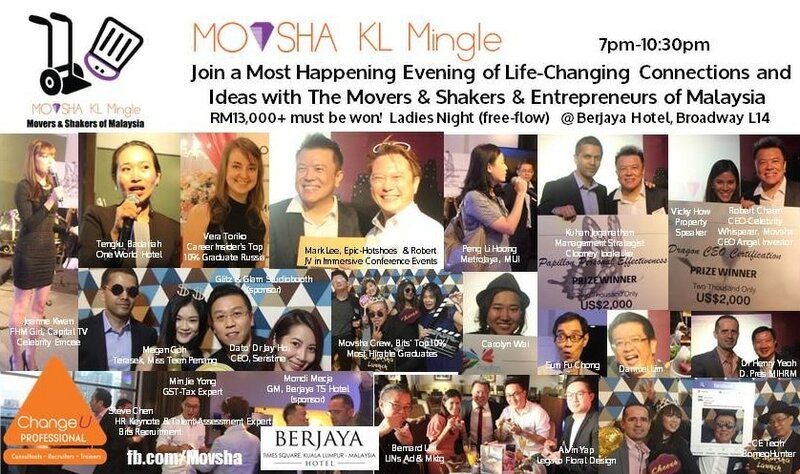 Movsha is the most influential international business networking creating life-changing connections and ideas with influential movers & shakers and entrepreneurs from across industries in Malaysia. Movsha KL Mingle is a place where we often present “Movsha Mover & Shaker Award”. Be inspired directly by the true story of the Award-Winner on how he/she became a mover & shaker in his/her industry, and exchange with other movers & shakers as they share their failures & successes, their ideas and secrets to their success. It is a place where movers & shakers, entrepreneurs and friends relax, mingle, enjoy some light entertainment & hors d'oeuvre, have serendipitous meaningful encounters and ideas exchange. ​Movsha advocates face-to-face meeting-mingles in this internet-online age. Lucky Draw to win great PRIZES, include a welcome drink and canapé. NOTE1: Dress code: business, office, smart casual. NOTE2: Bring a BOX of your Name Cards. NOTE3: Register HERE by clicking "GOING" for Guestcount for canapé preparation. 2. "Movsha Mover & Shaker Award"
3. "Movsha Mover & Shaker Lifetime Achievement Award"
1. Widely recognized in the relevant industry as a Key Mover & Shaker Industry Leader. 2. High profile brand recognition and news coverage of the brand and company that the individual leads. 3. Excellent and favorable image of the individual's contributions, leadership, vision, brand/product representation, and good CSR efforts.